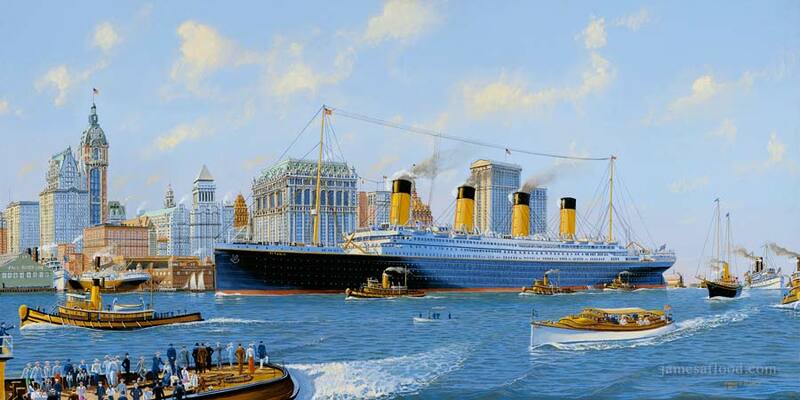 Art print 1912 skyline New York City, RMS Titanic Passing Lower Manhattan. Artist's fictional depiction of a successful arrival. In this painting, RMS Titanic is depicted making her way to New York Harbor, White Star Line, Pier 59 following a successful maiden voyage. Celebration bursts from the docks, crowds cheering in sequence as she maneuvers her way up the Hudson River. It is the morning of April 17th, 1912. In the background is the glorious skyline of Lower Manhattan, the magnificent age of the skyscraper still in its youthful beauty. Prominent buildings visible from left to right are as follows: Foreground Pier 14 (Fall River Line) backed by City Investment Building, then Singer Tower. Foreground Jersey Central Rail backed by Liberty Building and Washington Life. Foreground Pier 13 backed by US Realty Building, Trinity Building and Banker's Trust. Then visible above Titanic's lines and continuing left to right: Empire Building, Manhattan Life Building, Trinity Church Steeple, 90 West Building, Bowling Green Building, International Marine & Mercantile Building, and Greater Whitehall Buildings. Pier 1 and Pier A are visible in the distance just behind Titanic's stern.